Library For All is a non-profit organization with a mission to provide tools for individuals to learn, dream and aspire to lift themselves out of poverty. In response to the lack of access to books for over 260 million children, we are developing a digital library for the developing world, bringing together content from publishers as well as OER providers. The library is designed for low-bandwidth environments through the use of a local network topology. It is designed to be device agnostic, which means it can be accessed on a range of devices including mobile phones and low-cost tablets. Library for All has cultivated a model for a cloud-based digital library that addresses the most substantial barriers to accessing useful educational material. The cost of purchasing, shipping, and distributing physical books can be prohibitive for schools in developing countries, and printing or donating books in these countries is not sustainable. 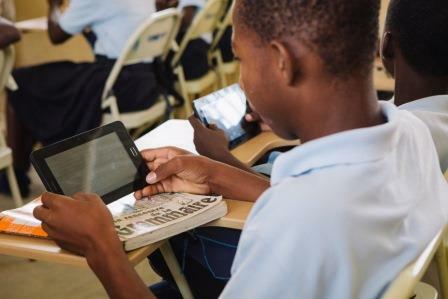 With the spread of mobile phone networks across the developing world, and the falling cost of powerful digital devices such as tablets, there is a momentous opportunity now to build partnerships to deliver access to a wealth of educational materials at a much lower cost. Library For All will offer the platform as a tool for existing NGOs and agencies familiar with the area of implementation and assist partners in choosing low-cost devices and setting up local area networks to access the platform. Our research partners at New York University are bringing their previous experience with executing digital technology programs in India to inform the distribution model and will conduct research on effectiveness once the pilot program has launched. The pilot program will be launched in October 2013, with the eager students of Respire Haiti School located in Gressier, Haiti, two hours from Port-Au-Prince. Of the 530 students at the school, over half were child slaves or “resteveks,” as they are known in Haiti. The staff and administration of the school are working closely with the Library For All team to design and implement the program. 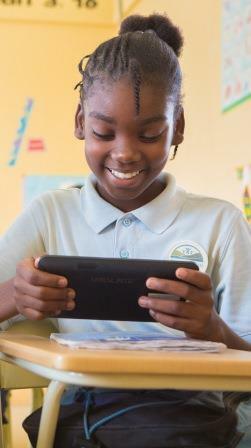 In 2014, Library For All plans to scale up across Haiti and pilot in two new countries. Our model is to reach 5 million users in 5 years through distribution partnerships with governments, NGOs and business.